IT Guy took this shot inside the boat on our way to Bohol few week ago. 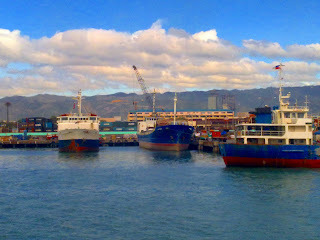 This is a facet of the port of Cebu. The boats are quite colorful, especially the blue and red stripes. Ooh love those intense blues! Ahh, that looks so nice n sunny n warm!! Such vibrant colors in your lovely harbor view! Get on one of those boats and come on! I have been searching for a long time for this! Finally I found it on Yahoo. The colors are beautiful and such a spectacular sky! A belated Happy WW to you!